Field notes provide valuable, primary research data about species and ecosystems that is often unpublished or unavailable through other sources. They can also be extremely valuable for museum research, providing key specimen data related to study sites, collecting details, and ecology. 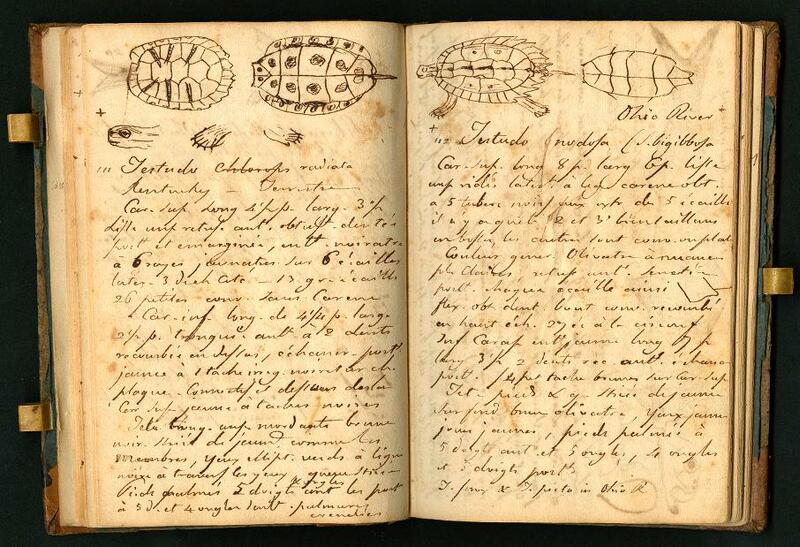 Page from Notebook kept by Rafinesque on a trip from Philadelphia to Kentucky, 1818, in the collections of the Smithsonian Institution Archives, via BHL. Over a two year period, the BHL Field Notes Project will coordinate work to digitize field notes, assign metadata, and publish the field notes online through the Biodiversity Heritage Library and Internet Archive, with an emphasis on quality, quantity, and closely related content. The Smithsonian Libraries and Smithsonian Institution Archives will serve as the lead institutions on the project. Additional project participants include Missouri Botanical Garden, Peter H. Raven Library; American Museum of Natural History; Yale Peabody Museum; Harvard University Herbaria, Botany Libraries; Harvard University, Museum of Comparative Zoology, Ernst Mayr Library; University of California, Berkeley Museum of Vertebrate Zoology; The New York Botanical Garden, The LuEsther T. Mertz Library; The Field Museum; and Internet Archive. The Digitizing Hidden Special Collections and Archives awards program, funded by The Andrew W. Mellon Foundation, funds projects in which locally executed protocols contribute to a national good, using methods that are cost efficient and subject to wider adoption. It supports the creation of digital representations of unique content of high scholarly significance that will be discoverable and usable as elements of a coherent national collection. Eighteen projects were selected from among one hundred sixty-seven proposals submitted in 2015. This is the first group of projects supported by the Digitizing Hidden Special Collections and Archives awards program.